WhiteWall.com offers a variety of high quality and unique services such as Photo under Acrylic, Photo on Wood, HD Metal and Aluminum prints, and hundreds of hand crafted, custom wood frames. 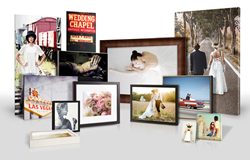 WhiteWall, a German photo lab renowned for producing gallery quality, handcrafted photofinishing products, announced it is sponsoring the Power of Print (POP) pavilion at WPPI 2016 and will create a print gallery of winning images from Rangefinder Magazine’s Photo Annual wedding and portrait photography contest. Winning images will all be produced* on an aluminum dibond substrate and hung for public display throughout the expo scheduled from March 7-9 at the MGM Grand in Las Vegas. In addition, several images from the Photo Annual will be produced in a variety of sizes and on several substrates and exhibited throughout WhiteWall’s trade show booth (Booth #116). WPPI’s Power of Print pavilion will teach photographers how to elevate and maintain their business through print sales and ensure long-term success with their business. A series of seminars, including the keynote presentation by renowned photographer Sue Bryce, will discuss creative ways to up-sell print packages, including the use of “emotion” to trigger an increase in print sales. In all, more than 15 sessions will be dedicated to the art -– and business -– of print. WhiteWall’s handcrafted and award-winning Photos Under Acrylic Glass, which have been recognized worldwide by photographers and galleries alike, have also been acknowledged by B&H Photo and Video as a world class leader in photofinishing. Photographers may now choose to order gift certificates directly from B&H Photo and redeem them at WhiteWall.com. Either way, photographers and enthusiasts can expect professional service and quick delivery times of fewer than 10 days anywhere in the U.S.
WhiteWall is the exclusive print lab to all 40+ LUMAS galleries worldwide, including two in NYC. Since the opening of the latest LUMAS gallery in Las Vegas in December 2015, photography amateurs can check out the different substrates and renowned WhiteWall quality in person at 3377 South Las Vegas Blvd. (near The Venetian). LUMAS was created to give art and photography collectors an opportunity to acquire exceptional photographic art at prices affordable for everyone. *26 contest winners were announced. 24 winning images will be reproduced. WhiteWall is a brand owned by Berlin-based Avenso GmbH, which has operated the photo lab as well as the WhiteWall.com online service since 2007. Photography hobbyists and professionals around the world rely on WhiteWall’s exceptional quality. With its LUMAS brand and more than 40 galleries around the world (three in the US), Avenso GmbH has been democratizing the art market for over ten years through its hand-signed art editions by renowned international artists. B&H Photo, the largest photo retailer in the US, also recognizes WhiteWall’s world-class quality and now offers their gift certificates, redeemable at WhiteWall.com. All of Avenso GmbH’s photographic works and products are exclusively produced in, and shipped from, the WhiteWall photo lab in Frechen, Germany, just outside of Cologne.